Discussion in 'Emergencies / Diseases / Injuries and Cures' started by TheChickenTrainer, Jun 16, 2017. If you look up "chicken walking like a penguin", a lot of times it will come up as (this chicken may be egg bound) but don't let that fool you. There can be quite a few reasons to why your pet chicken may be walking like a penguin (dinosaur) (sumo wrestler) etc. which needs to take immediate attention. Here is a list of some possible causes. Roundworms - There are a few different types of roundworms including threadworms, hairworms, and the large roundworm which is most common. These can be found anywhere in your chickens digestive system. You may be able to see the worms in your chicken's droppings. Gapeworms - These worms attach themselves to the trachea of the chicken. A chicken with Gapeworms will ‘gape’ which is where they appear to be gasping for air and will stretch their head and neck up to the sky. It is more common for these worms to be picked up through intermediate hosts such as worms, slugs, and snails. Tapeworms - These worms attach themselves to the lining of the intestine. 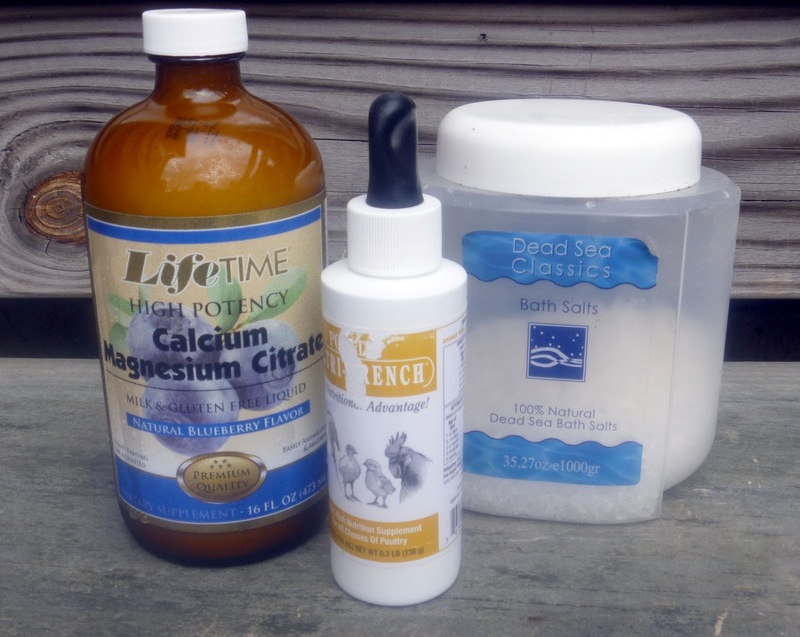 These are less common but can significantly weaken your chickens immune system. The life cycle of worms mean that getting rid of these pesky beasties can be particularly hard. Your chickens can directly or indirectly ingest worm eggs. Direct ingestion means they will eat the worm egg. Indirect ingestion means they will eat a worm or another bug that is the host of the worm egg. The worms will then happily live inside your chicken reproducing and laying eggs which will be passed out in your chickens droppings and the cycle begins again. If your chickens are infected it is much easier to get rid of the worms if you move your chickens to a new grazing area regularly. This is so your chickens won’t be continually ingesting the worm eggs which are in your chickens droppings. It can be hard to tell if your chickens have worms which is why prevention and regular worming is important. A chicken with worms will go off lay, may have diarrhoea, will eat more, and in severe cases will lose weight. A serious infection can be fatal. Chickens with Gapeworm will stretch their neck gasping for air. Preventing worms is much easier to do than to treat a worm infection. You can prevent worms using a number of products. Omlet stock a range of herbal worming treatments such as Verm-X that can be administered to your chickens feed or water every month. Your other option for prevention of worms is a to use a chemical called Flubenvet which can be administered every 3-6 months. Apple cider vinegar is another natural remedy that is not only a natural wormer but good for your chickens overall health. A teaspoon of this per litre of water regularly will be sufficient to keep your chickens in tip top condition. You will need to regularly (preferably every day until you think your chickens are worm free) move your chickens onto a new grazing area to stop them from continually ingesting worms. If you can’t move your chickens then you can buy products to sanitise the ground to kill the worms. Keeping the grass short will help as the sun's UV rays will damage and kill the eggs. If you suspect your chickens have Gapeworm then you will need to use chemical treatment such as Flubenvet or Solubenol which you can get from licensed sellers or the vet. Herbal treatments such as Verm-X should be able to deal with other types of worms. DO NOT SOAK YOUR CHICKEN or ROOSTER IN WATER IF YOU THINK SHE OR HE HAS WORMS. KEEP READING BELOW. Imagine one of your hens is acting funny. She is fluffed up, her eyes are closed and she is lethargic. You notice her sitting on the ground and maybe dragging her wings. Her tail is down and most likely she is straining or pumping her backside. Upon closer examination you may notice that liquid is dripping from her vent and you may feel an egg-shaped lump. All signs of an egg bound hen. double yolk egg that is too large to pass through, genetics or a calcium deficiency. Calcium is needed for proper muscle contraction. Too much protein in a hen's diet can also cause egg binding. Other potential causes are stress, internal worms, low quality feed, dehydration or weakness from a recent illness. 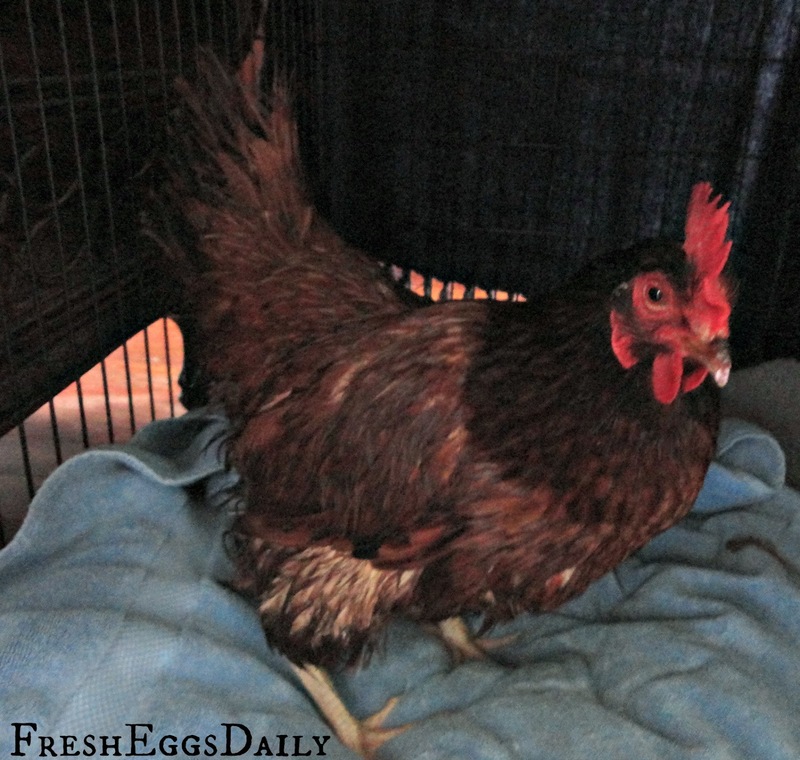 As soon as you have identified an egg bound hen, you must treat her quickly. An egg bound hen will die if she is not able to pass the egg within 48 hours, so once you have made your diagnosis, treatment should start immediately. You want to handle your egg bound chicken carefully to avoid breaking the egg inside her, which can lead to infection and possible death. (Peritonitis, an infection caused by egg material stuck inside the hen must be treated immediately with an antibiotic, such as Baytril, and probiotic powder to build up her good bacteria.) But even if the egg hasn't broken, you will want to treat her as soon as possible. Submerge her lower body and vent in warm water with some Epsom salts for about 20 minutes, gently rubbing her abdomen. Remove her gently from the bath and towel dry her, blotting her feathers carefully. If it's winter or there's any draft, dry her off with a hair dryer set on low heat. Then rub some vegetable oil around her vent and very gently massage her abdomen once more. Put her in quiet, dark location in a large crate or cage. A dog crate or bird cage with a towel or blanket draped over it, a towel that has been warmed in the dryer on the bottom, and set over a pan of hot water (or with a heating pad under the towel) with a heat lamp is perfect. You want to create moist heat. Give her an eyedropper of Nutri-Drench and 1cc liquid calcium (or read supplement label instructions). Then give her some time to herself. 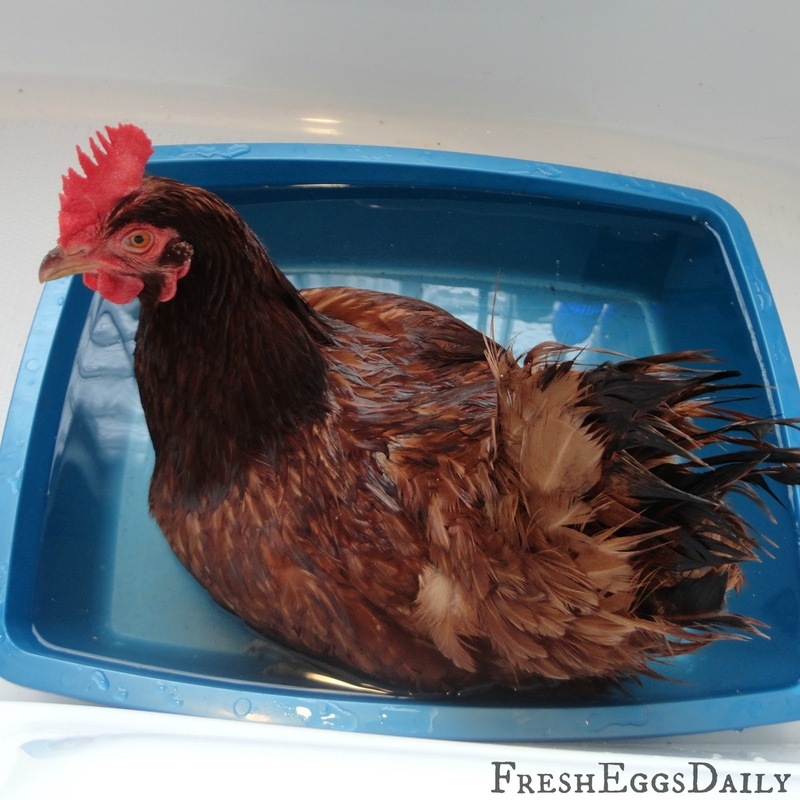 Repeat the soak in the tub every hour or so until she lays her egg. As a last resort, a visit to a vet is recommended or, if you can see the egg, you can carefully extract the contents of the egg using a syringe and then gently crush the shell, keeping the fragments attached to the membrane and remove it using vegetable oil squirted in and around the vent. This is risky and carries with it the danger of your hen contracting an infection, so should ONLY be used after all other remedies have been tried. Avoid supplementing light in the coop. Please note: IF YOU SEE WORMS COMING OUT OF YOUR CHICKENS VENT while soaking her, IMMEDIATELY!!!!!! TAKE HER OUT OF THE WATER AND PUT HER OUTSIDE. The reason this is, is because water going up her vent will irritate the worms even more and cause them to attack the chicken from the inside out even faster and kill the hen within minutes. Next you will want to take her to the vet AS SOON AS POSSIBLE and get her treated. It's the only option available by this point. It's a for sure life or death situation. No guarantee that your pet will survive. Don't be embarrassed of taking your pet chicken to the vet, because your pet's life relies on it. All together, try not to worry about how much everything will cost, just as long as your chicken survives. If you for sure are no where near a vet that accepts chickens, you can try getting a dropper and putting some apple cider vinegar in it and gently prop it into your pets beak and slowly release it into her. (NOT TOO MUCH THAT IS) (TRY NOT TO GET HER TO PANIC) Also try getting some de wormer from the store and give it to your hen. If your hen doesn't take it, gently, depending on if it is a fluid, repeat the steps above for the apple cider vinegar by using a dropper and prop your chickens beak open and put some in. NEXT remain calm no matter what happens; whether your pet survives or not, just trust God and know that we are praying for you. If she doesn't survive, just know that she is in a better place that none of us can even comprehend/imagine. (Heaven) GOD bless you. Fluid can accumulate in the abdominal cavity, secondary to heart disease or tumors in the heart and liver Fluid in the abdominal cavity is usually accompanied by respiratory distress and cyanosis (bluish color) of the combs and wattles. There is no treatment for ascites. Several diseases, such as Marek’s disease, lymphoid leukosis and various adenocarcinomas, cause tumors and enlargement of a chickens internal organs such as the liver, which might, in turn, distend the abdomen. Tumor diseases tend to be chronic, and affected chickens slowly suffer weight loss and decreased appetite. All day-old chicks should be vaccinated for Marek’s disease at the hatchery. Lymphoid leukosis can be transmitted from hens to developing embryos; therefore, disease-free chicks should be purchased from reputable hatcheries. There is no treatment for tumor diseases. Chicken walking problems aren’t uncommon. It could be a momentary limp from stepping on something that’s sharp or that stuck to its foot, or a minor to serious problem. Toes and legs can be broken by large animals and people if chickens get underfoot or vehicle, or if they become stuck in a small space. Chickens are subject to all kinds of injuries and it’s the job of their keepers to try to prevent them. When establishing your chickens’ environment it’s important to attempt to remove or repair anything that is or could be a potential hazard. Bumble foot is a condition in chickens that can be caused by a small cut becoming infected, swollen and sore. In healthy chickens most minor wounds heal quickly but foot injuries subject to bacteria from droppings, can persist and cause lameness without some first aid. Most chicken walking problems heal on their own. Some wounds need a thorough cleaning, removing any foreign particles, like a splinter, thorn, metal or glass shard, and applying an antibiotic spray. If a deep cut or sore, a bandage may be needed to allow antibiotic salve or spray to penetrate and prevent bacteria from entering. Vet wrap and a little gauze can form a light weight bandage that doesn’t restrict movement. predator attacks If you notice a chicken walking poorly or unable to walk you should catch it and give it a thorough examination. Suspect disease if there are no outward signs of injury. A chicken in this condition must be isolated from the flock to prevent possible spread of disease and the unwell chicken from being bullied and picked on by the flock. An unwell chicken can draw attention to the flock from predators, so removing it will benefit all. Production hens are often laid out by this age and major organs can fail to maintain good health. A common disorder in Production hens is called “egg yolk peritonitis”. Soon, for such a chicken walking will become impossible. The hen’s reproductive organs release egg follicles into her abdomen causing infection and much swelling. A hen with this problem will begin waddling with a wide stance to accommodate the excess fluids throwing her off balance. If this condition is allowed to progress her added body weight will become too much for her legs, and she will be unable to get herself to food and water. Sadly, other than expensive surgery removing her reproductive organs and excess fluids, she will die. Without corrective surgery, trying to keep her alive will only prolong her suffering. This is an infection, so any hens in this condition should not be used for the table but humanely put to sleep and disposed of. High fever, heat stroke, hypothermia, dehydration, poisoning, progressed diseases and malnutrition could all cause difficulty for a chicken walking. Young chicks usually emerge from their eggs in great health. But even in such young ones walking problems can be seen and need to be dealt with quickly if they are to survive. Young chicks grow fast inside and out and any health issues can prevent normal brain, organ and immune system development that will prevent them from maturing into a healthy adult chickens Through the years we have answered many question about different problems with a chicken walking. Hopefully this easy access to previous questions and answers will give you the help you are looking for; or a just a good education in these issues so you’ll know what to do if you ever find one of your chickens having trouble walking. ArianDolympia, valeriem205, elaineinspain and 4 others like this. So I had a chicken like this. We didn't know what was wrong with her and she really wasn't doing well. She was waddling around for a couple of weeks and was in and out of the house. We took her to the vet and turns out one of her eggs had missed the fallopian tube and had developed in her abdomen. The vet could've drained the fluid and gotten an ultrasound but she said that she just did this to a chicken and they came back in 7 months. It was going to be about $400, so we decided to put our chicken down. She was 4 and a half and not really lying so we didn't really want her to be in any more pain. Hehe, just kidding. Thanks for a very detailed post!